Even the toughest men need protection from the harsh environmental elements that accelerate skin's aging process. 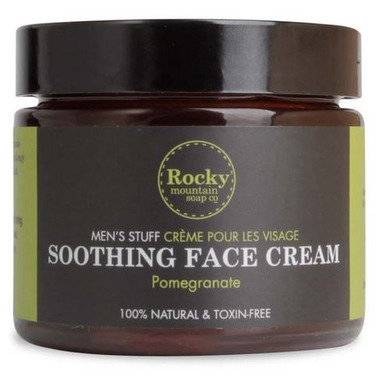 Rocky Mountain Soap Co. Men's Soothing Face Cream offers rich anti-oxidants, like Pomegranate Oil, and powerful moisturizers, like Black Oat Extract and Babassu Oil, to leave your face feeling naturally soft and protected all day long. I LOVE this product. It is not too greasy, just enough moisture for Northern winters for my dry, sensitive skin. I love Rocky Mountain soaps, and face care. I usually order the "women's" version of it, if you want to call it that. It is the exact same product, and now I can get it from my other fav place to shop! It works well on my skin. I totally recommend this. Unfortunately it did not suit my husband's skin. Blemishes and pimples started the next day he started using it. He is 40+ and was'n prone to any skin issues. Although this says itâ€™s a â€œmenâ€™s creamâ€� it contains the exact same ingredients as Rocky Mountains day cream (which well.ca doesnâ€™t carry at this time for some reason). Iâ€™ve been using this cream for over a year. I love it. A jar lasts about 3 months. I have combination skin and I donâ€™t find it greasy at all. If you have dry skin you may need to add a few drops of an oil to it, especially in the winter. Iâ€™ve had to add a drop of oil to mine but itâ€™s been crazy cold here in Ontario lately. Itâ€™s canadian, itâ€™s light and I totally recommend it.